Whether you do it for fun or as a profession, ping pong is one of the most interesting sports. Now, the good thing about this sport is that you can play it from indoors or outdoors depending on what the Weather Nature dictates. Obviously, no one wants to remain indoors when the weather turns attractive. For this reason, an outdoor ping pong table turns a necessity for anyone who wants to transfer the indoor fun to the outside fresh air. However, with a plethora of these tables already shouting loud in the market, sifting out the one that will give you the best experience remains an uphill affair. To free you of the turmoil, we have put together a list of the ten outdoor ping pong tables that are worth giving a shot. Come, take a walk with me as I explore our top-notch picks. Whether you want it for your office or home, the design of this table dovetails with any space. The unit comes 95% preassembled to rid you the hassle of complicated setup. The durable construction is one of the things that makes it a good option for those that value longevity. This unique design allows you to separate the tables into two halves. This chassis design also couples with the lightweight property of the table to make transportation a breeze. The two-piece design also takes up much significant space as compared to the conventional models. The 3-inch casters let you transfer the fun to your favorite spot with ease. The heavy-duty casters are made with durability in mind for years of unlimited mobility. After coming to your favorite playing spot, use the dependable lock mechanism to prevent the table from moving when the play is on. After aligning the two halves of the table, the latch mechanism at the underside of the table lets you lock locks it in an upright position. This feature prevents accidental opening so that you will never have to pause the game to readjust the two halves. 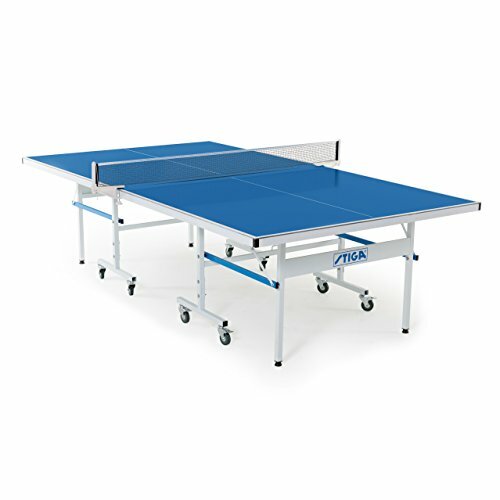 Although it is not the thickest model on the market, the board thickness of 5/8″ offers a better bounce as compared to most of other table tennis tables of the same caliber. Moreover, the top surface is tailored to provide resistance to the harsh outdoor elements so that you get years of fun. Assembling this table is easy. Not the best lightweight option. If you are in the lookout for durability, it would be wise to try out this option. The table comes with sturdy construction that withstands the harsh outdoor elements. It comes with sturdy casters for easy portability. The table also separates into two halves to permit versatility and allow for space-saving storage. The table top of this premium-grade table is of sturdy aluminum material. This material offers excellent bounce for optimized playing experience. The aluminum material also resists rusts, warps, and UV to guarantee years of fun. The high-quality wheels have ball bearing construction that delivers effortless rolling. This feature makes transportation of the ping pong table a breeze. The 3-inch casters also lock with ease to prevent the table from accidental shifting after setting up. This table comes with sturdy 1.25-inch steel legs that offer the much-needed stability to the table. The legs feature rubber levelers that give you an even play surface regardless of where you decide to set it up. The self-opening design of the legs offers more convenience when opening or closing the two halves of the table. The independent design allows for convenient storage. 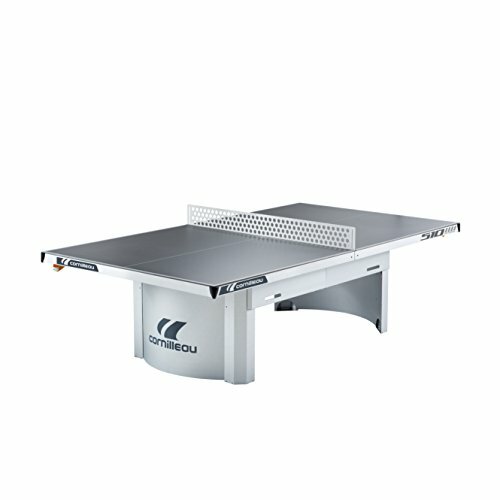 If you are passionate about table tennis but hardly find a partner to play with, this table folds easily to deliver playback mode. The sturdy wheels let you move the setup effortlessly in your backyard, patio, or your favorite play spot. JOOLA Outdoor Aluminum table also comes 95% assembled so that you spend less time putting it together and more time in the fun. One of the amazing features about this unit is that it comes with sturdy feet that offer exceptional strength. Since outdoor surface will not always be as smooth as the indoor, the legs of this table are customizable to accommodate any outdoor terrain. The table folds into two halves making it compact for easy storage. The folding design makes it a multi-use table, rendering it an ideal option for those in the lookout for a versatile model. Each half features four wheels so that you can move it alone with ease. 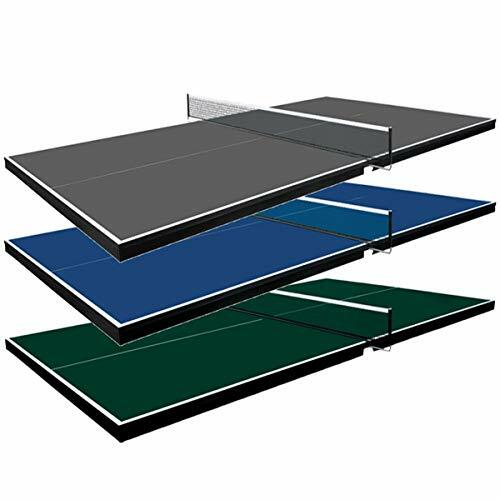 Although most people do not pay attention to the quality of the net, it is one of the essential factors that one should take into consideration when buying a ping pong table. JUULA Outdoor option comes with a weather resistant net to ensure durability. The net features screw design and advanced tensioning system for an ultimate experience. 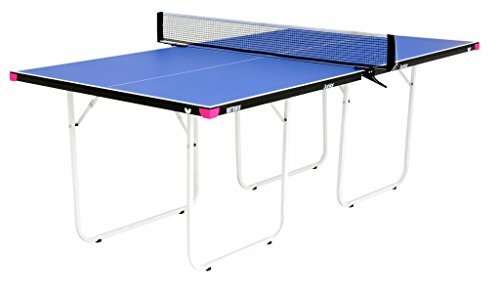 If you need a ping pong table that will not give you a hard time when putting it together, this would be a good option for you. In fact, you won’t even need to wait for your partner to help you-you can set it up on your own so that the partner finds everything ready to begin the play. The adjustable feet offer a leveled playing surface. You will need to unscrew the net before you store can is somehow a hassle. If you have limited indoor space, adding this ping pong table to your backyard would be a good idea. The table features a Melamine resin top which is waterproof and resistant to weather for extended durability. This unit comes nearly fully assembled to save time. The 6-mm thick tabletop is of aluminum composite that offers great bounce that will remain consistent over the years. The weatherproof tabletop means that the unit will stand up to the unforgiving sun of the summer and resist humidity damage. The weatherproof tabletop is paired with an all-weather net to make the entire unit completely weather resistant. The net features an advanced screw design and tensioning system that not only keeps the net in perfect position when in play but also allows for a time-saving assembly. Want to have the fun but no one around? No problem! Just fold one half of the table to the playback position for you to enjoy an ultimate solo play experience. Your partner will always find you well equipped for a challenge. Whether you need to move each as a single piece or nested together, each independent half of the table comes with four high-quality casters. The casters are engineered to not only resist wear and tear but also to roll over almost any terrain for unlimited mobility. The tabletop doesn’t warp easily. Safety locking mechanism keeps the table in place. The sturdy legs ensure stability. The paddles are not the best. This outdoor ping pong table is specially designed for the highest level of competition. The unit packs fantastic features and a space-saving design that takes little floor space. The 1-inch top surface features 20 layers of coating for maximum strength and perfect bouncing ability. The steel supports keep the unit firmly in place when playing. And since steel is naturally nonresistant to rust, powder coating covers the sturdy steel construction to provide resistance to rust. The powder coating also allows the unit to withstand harsh weather. An even surface is a must-have to get optimized playing experience in table tennis. With this in mind, each leg of this table is easily adjustable depending on the nature of the terrain. The top, feet, and casters are all of superior quality. 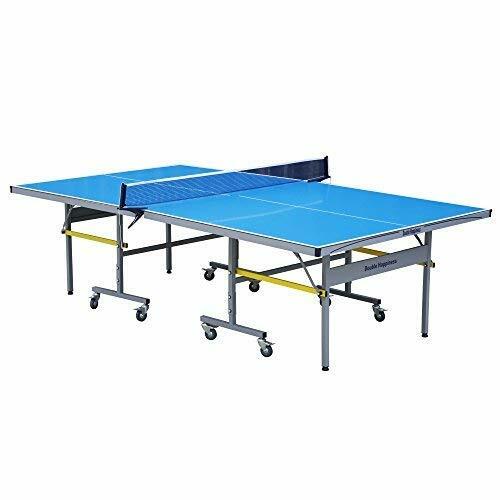 In other words, if you are looking for a ping pong table that will last for years, Hathaway Victory table tennis table is one of the most durable options you will come across in the market. The advanced safety mechanism meets the stringent US and European standards. Comes with plenty of extras to get you started. The wheels may not offer the smoothest motion. If you are looking for a combination of durability and stability, giving this ping pong table a shot would be a wise idea. The top-grade table features superior construction to ensure maximum strength. It also possesses weatherproof properties for all-year-round use. Cornilleau-Pro 510 is finished in silver that gives it unmatched elegance. The beautiful design holds the promise of stepping up the beauty of any outdoor space, making it an ideal option for you if you are an aesthetic enthusiast. The low profile feature of this table is also another great feature that makes it unique. The unique design means that the unit is wheelchair friendly and an ideal option for those that want to involve juniors in the play. The design of the feet offers excellent stability and a level playing surface. Nets of fabric material tend to tear with prolonged exposure to the outdoor elements. For this reason, this outdoor addition comes with a stainless steel net that will neither rust, corrode nor split. I mean, the stainless steel net should give you peace of mind when it comes to durability. This commercial-grade table comes with 19mm tabletop. This thick surface ensures great bounce, making it a good option for anyone intending to take their skills a notch higher. The table features a versatile design hence can serve as a pool table or dining table. The unit features 1.5-inch detachable metal rails that offer protection to the table and maximizes stability. 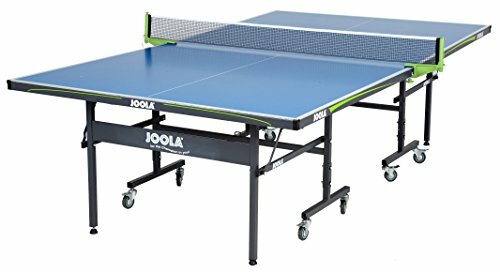 This feature elongates the longevity of the table and provides a professional playing experience that takes your table tennis skills to a higher level. 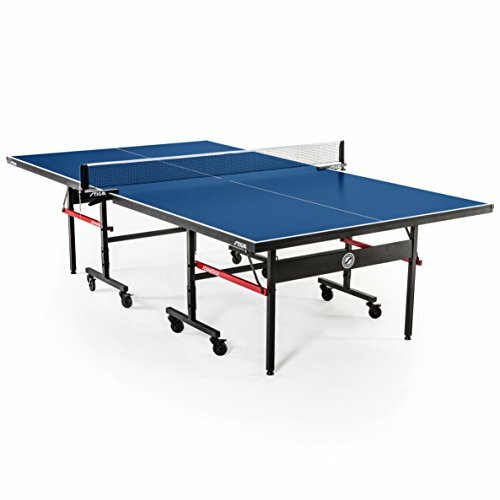 If you need a ping pong table that can offer competitive play, this would be a good option. The unit comes with an ultra-thick tabletop that provides excellent and consistent bounce so that you get a playing experience like no other. After pairing the two halves of the table, you can use the dovetail connecting mechanism to prevent them from separating when playing. The connectors also offer enhanced stability to the table. Available in three color assortments. It is a sturdy option. The side sections offer additional corner protection. 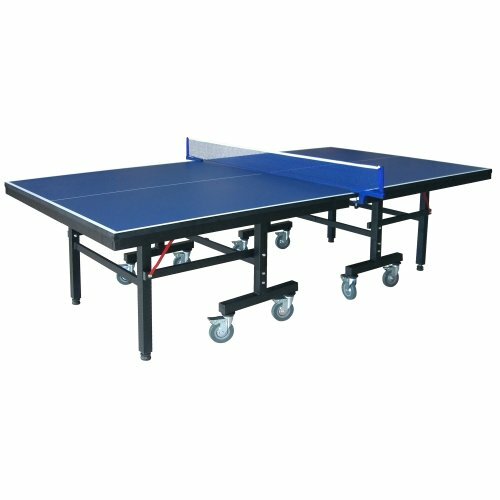 If you are looking for a ping pong table that is a bit larger than the average size, consider trying out this option. The table comes fully assembled so that you can have fun just straight from the box. The unit is available in two colors, green and blue so that you can choose the one that nicely blends into your space. To get a greater bounce, you need a thicker tabletop. And yes, Butterfly Junior Ping Pong Table has a 12-mm tabletop, a thicker top than those of most tables. With the enhanced bouncing capability, sharpening your ping pong skills have just gotten simpler! Transporting the entire table as a whole can be a real hassle. Taking this into consideration, this table is designed to allow for easy separation into two separate halves that are lighter to transport and more compact for space-saving storage. Each of the halves has two wheels that permit effortless mobility. If you have owned a ping pong table before, you might have realized that the majority begin to get damaged from the corners. This explains why the corners of this unit are equipped with corner pads that offer protection to the table for elongated service life. The corner pads also ensure your safety. The slightly larger size keeps the ball in play for longer. It doesn’t come with a connector. Just in case you need something classy, this should make a good ping pong table for your home. The stylish design of the table renders it a nice addition to the family living area. The professional-grade 18-mm surface delivers consistent bounce. The size of ping pong tables may differ. 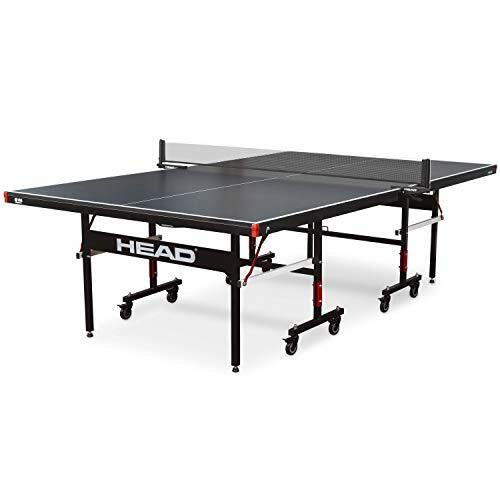 Head Summit Ping Pong table comes with the standard size of 9′ x 5. The regulation size makes it a good option for both the professionals and those developing the passion for the game. This table arrives with eight sturdy wheels. The wheels roll with ease for smooth movement in your outdoor setting. The high-quality casters also lock with ease to ensure that the unit remains in an ideal position so that you don’t keep on adjusting the table when amid the game. Assembly work can sometimes get challenging especially for the first-timers. This table arrives nearly entirely assembled so that you don’t have to read the long instructions in the manual when putting it together. The official size makes it ideal for professionals. You need to buy paddles and the balls separately. This unit features an aluminum surface for exceptional strength. The Kettler patented technology underside offers advanced weather protection while the playback mode keeps you ready to take on any challenge. The 2-inch steel legs offer great support while the powder coating renders them resistant to corrosion. The resin apron prevents warping and damages caused by long term exposure to the UV rays, making it among the durable ping pong tables that the market currently offers. The state-of-the-art design allows you to fold the unit for a gapless solo play easily. The permanent net system means that you don’t have to attach the net every time you need to store the table since the unit comes with a unique folding design. This outdoor ping pong table comes with six-inch rubberized casters that grant you convenience in moving the table around the backyard or patio. The racquet and ball holder allows for convenient storage of the accessories when you pause the play. The uniqueness of this ping pong table lies in the locking mechanism. The table comes with an advanced dual locking system that keeps the table firmly joined when playing and prevents accidental closing. It comes with the regulation size. It features an ultra-thick surface. Since the unit is for use in the outdoor environment, you should ensure that the surface is of sturdy material with weather resistance properties. Most of the tables come with aluminum construction. Although most come with the regulation size of 9′ x 5′, there are also smaller and larger sizes. However, if you need it for a competitive play, choose the standard size. Some designs allow for playback mode while others do not. Choosing the ones that permit solo play is an added advantage since you won’t necessarily need an opponent to play. For an easy time in set up, ensure that you choose a lightweight ping pong table. However, it’s vital to ensure that you do not compromise on strength since it’s also important. Can you leave the table out all the time? Well, it depends on the nature of the materials of the table. However, most of the ping pong tables can be left outdoor since they are weatherproof. Do the tables come with balls and paddles? Some come with all these accessories but there are a few models that you have to buy them separately. Do these tables come assembled? Most of the tables come 95% preassembled so that you take a few minutes in the remaining work. However, some come fully assembled to deliver fun straight from the box. The ping pong table you choose can define the level of fun you get. Therefore, it is vital to pay a keen eye when selecting the perfect addition for your outdoor space. And since it remains a daunting affair, this article provides suggestions of good models you should try out.